This film divides itself into three acts. 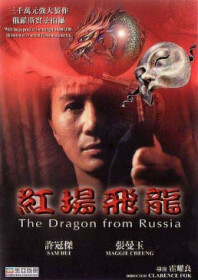 The first act sees Sam Hui and Maggie Cheung living out a loving relationship in Russia, before Sam is hoisted from a train by the ‘Dragon Master’ and taken back to a forest in Asia. The second act is perhaps the most disjointed and puzzling. Sam’s memory is erased and he is trained to become a hired assassin working for the 800 Dragons organisation, donning a white mask and adopting the ironic moniker of ‘Free Man’. The final act is a bit more together, in which Hui’s latest hit turns out to be his former lover. He remembers enough of their courtship to start fighting back against not only the Dragon Master and his cohorts, but also the Japanese mafia. Director Clarence Fok is noted for his visual flair and when the film stops to catch its breath, it possesses a real sense of style. The Russian locations are used tactfully, but the more obvious influence is Japanese cinema and comic books (it is based on the Crying Freeman manga, itself given a Canadian makeover in 1995 by Christophe Gans). The martial arts sequences are quite remarkable, despite the strange casting of pop singer Sam Hui. Some of Hong Kong’s leading female talent (Maggie Cheung, Nina Li Chi, and Fok’s favourite Cat III girl, Carrie Ng) also help to make the film effortlessly watchable. AKA: Crying Freeman: Dragon from Russia.